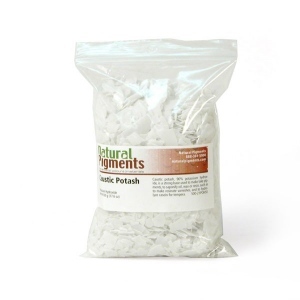 Details Potassium Hydroxide, also known as caustic potash, is a strong alkali. It is usually sold as translucent flakes or pellets, which become tacky when exposed to air because it is hygroscopic. Consequently, it characteristically contains varying amounts of water, as well as carbonates. Its dissolution in water is strongly exothermic, meaning the process gives off significant heat. The concentrated aqueous solution of potassium hydroxide is called potassium lye or potash lye. Potassium hydroxide is used in making lake pigments, to saponify (form soap) oil, wax or resin, such as rosinate for varnishes, and to hydrolyze casein to make tempera paint. It can be substituted with sodium hydroxide, another strong alkali. Approximately 121 g of potassium hydroxide will dissolve in 100 mL of water at room temperature (compared with 100 g of sodium hydroxide in the same volume). Lower alcohols such as methanol, ethanol, and propanols are also excellent solvents. The solubility in ethanol is about 40 g potassium hydroxide in 100 mL ethyl alcohol. The saponification of fats with potassium hydroxide is used to prepare "potassium soaps," which are softer than the more common sodium hydroxide-derived soaps. Because of their softness and greater solubility, potassium soaps require less water to liquefy, and can thus contain more cleaning agent than liquefied sodium soaps. Keep in a tightly closed container, stored in a cool, dry, ventilated area. Protect against physical damage. Isolate from incompatible substances. Protect from moisture. Addition to water releases heat which can result in violent boiling and spattering. Always add slowly and in small amounts. Never use hot water. Containers of this material may be hazardous when empty since they retain product residues (dust, solids); observe all warnings and precautions listed for the product. Wear impervious protective clothing, including boots, gloves, apron or coveralls, as appropriate, to prevent skin contact. Use chemical safety goggles and/or full face shield where dusting or splashing of solutions is possible. Refer to Material Safety Data Sheet. DANGER! CORROSIVE. CAUSES SEVERE BURNS TO SKIN, EYES, RESPIRATORY TRACT, AND GASTROINTESTINAL TRACT. MATERIAL IS EXTREMELY DESTRUCTIVE TO ALL BODY TISSUES. MAY BE FATAL IF SWALLOWED. HARMFUL IF INHALED. 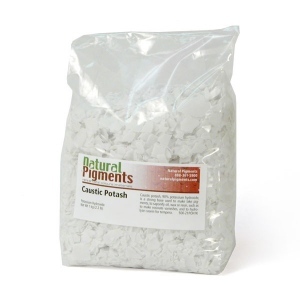 This product is toxic to aquatic organisms, and may cause long-term adverse effects in the aquatic environment. If product is spilled, comply with Federal, State and local regulations on reporting spills. Refer to Material Safety Sheet and labels for further details.